Beverly's Official Blog | News and findings from world of crafts, scrapbooking and more: Deal of the Day Starts Online Tomorrow! 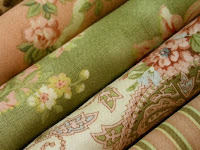 The Beverly Fabrics website is starting an amazing new deal! Every day starting at 9 AM (PST), we'll have three deeply discounted fabrics on sale from our homepage (not as pictured). You will want to make your purchase quickly, we only have a limited amount available at these great prices. Every 24 hours, we'll offer three new fabrics at $2.97 a yard. This special sale starts February 16th, 2011, so don't miss out! Visit Beverlys.com tomorrow at 9 AM so you don't miss out on this great fabric sale! Sounds great! Can't wait to see what ya got!